All dogs have a natural desire for chewing and if not provided with a proper chew toy they will focus their attention on furniture. Until you manage to train your dog it is best to invest in a proper dental treat. dental chew can keep his teeth clean. Many owners are unaware of the importance of a proper and regular dental care, so an occasional treat can go a long way in keeping your pup’s teeth healthy. On the other hand, you need to realize that not even the best dental chews for dogs can replace teeth brushing. So it is advisable to mix teeth grooming with dental chews for pearly white teeth and fresh breath. There is a variety of dental chews and some of them are formulated to help remove tartar and plaque buildup. In order to help you find the right match for your pup, we will tell you what are the best products currently available. This is an affordable and yet tasty treat that is appropriate for all dog sizes. Dingo also has a variety of other shapes and sizes of dental treats if you aren’t a fan of sticks. These contain rawhide that posses abrasive properties and is good at removing tartar and plaque buildup. And if your pup doesn’t have these problems you can use this dental chew as a preventative measure. Your pup will for sure love these since they are chicken flavored and contain real chicken in the middle. This makes them a great protein source, but you need to be aware that your pooch is ingesting extra calories. The recommended amount of these chews in one per day, and take into account that one chew is equal 30 additional calories. Since Parsley seed oil is incorporated this tasty treat will reduce the foul odor from your dog’s mouth. You may need to wait for 6-8 weeks for some visible results, but if you don’t see any after that period you can ask for a full refund. For a safe and proper use, supervise your pup while he is chewing and provide him with plenty of water. Nylabone is a family owned company that has been making chewing toys for more than 50 years. This is a U.S based brand, hence you can rest assured when it comes to the quality of this product. This brand specializes in making chewing toys for aggressive and destructive chewers that also cleans their teeth. We chose double bone chew that is appropriate for medium-sized dogs that weigh up to 35 pounds. Made of tough and durable nylon this Power Chew toy is designed to keep bored dogs entertained. Furthermore, Power Chew has four textured chewing ends and bristles raised during chewing that promote plaque and tartar control. To make this toy more interesting and irresistible Nylabone infused it with real bacon flavor that is a real hit with dogs. This is an affordable and long-lasting toy, that won’t leave any mess behind and will keep your dog entertained and away from your valuables. Power Chew is also available for small and large dogs, and this brand has a variety of other dental chews if this one isn’t the right fit. Most importantly, all of their products including this one are made to stimulate healthy and strong teeth. Milk-Bone started making delicious dog treats more than 100 years ago. Furthermore, this is a U.S based brand and this product is certified by the Veterinary Oral Health Council. This means that Brushing Dental Chews will remove plaque and tartar from your pet’s teeth. This is an edible chew, and we picked a mini breed size, but these chews are also made for medium and large dogs. For optimal effect give your pup one treat every day, and combine this with at least twice a week teeth brushing. What makes this product great is a special twist design that can reach even the back teeth and clean the gum line. Moreover, these chews have nubs and ridges that have the same effect as toothbrush bristles. Brushing Dental Chews are chicken flavored, and hard to resist, but you must keep in mind that one chew contains 31 calories. In order to get the best results, buy a size appropriate chew, since a large dog will simply swallow the smaller treat. Milk-Bone also added 13 essential vitamins and minerals, including calcium for strong and healthy teeth. This dental chew is appropriate for dogs weighing 5-24 pounds and is advisable to supervise your pup while he is munching. This is also an American based brand, and the difference is that they make grain-free dog chews. Besides this apple flavored treat you can pick carrot flavor that is appropriate for small, medium, and large dogs. In this product, you will find natural fresheners like alfalfa, rosemary, parsley, and fennel that are incorporated to freshen your dog’s breath. Besides that, this is a grain and gluten-free treat which makes it perfect for dogs with allergies. The texture of this chewy treat is specially made to support teeth cleaning, plaque and tartar control. You can also use it for a dog that doesn’t have these problems. Z-Bone Dental Chews can’t be given to dogs that weigh less than 5 pounds and have less than 6 weeks since the pieces can be too big to swallow. This apple flavor is suitable for dogs weighing 10-25 pounds. And you should stick with the size appropriate for your dog. Easy to digest and natural ingredients will not only remove the foul odor from your pup’s mouth they will remove it from his gut. The recommended amount is one treat per day, for strong teeth and healthy weight. This durable chew toy is made of natural cotton fibers and has dental floss twisted in it. This feature sets it apart from other similar tug rope chew toys. While playing with it, your pup will clean his teeth and since Boota incorporated baking soda, this product also reduces plaque and tartar. Furthermore, this floss rope is mint-scented and will remove your dog’s bad breath. We chose an extra large rope suitable for giant breeds, but you can go with medium or large depending on your pup’s size. Since it is made of cotton this toy can be used for dogs that have sensitive gums and mouth. Non-irritant properties make this product great for dogs that already have dental problems and aren’t able to chew on harder things. Still, you should supervise your dog while he is playing with it, and you can get involved as well. Pedigree is a well-known pet brand and they have been making these Dentastix chews for some time. Besides this beef flavored treat, they have a mint, original, bacon, and grain-free options. Their product can be found for all dog sizes, and this, in particular, is designed for large dogs. The beef flavor is one of the favorites, and your pup will go crazy about it. And although this product doesn’t have the VOHC seal of approval, the manufacturer claims that this product is clinically tested. Moreover, it is capable to reduce plaque and tartar deposits and improve the dental health of your dog. The special texture and X shaped chew is able to clean between the teeth and down to the gum line. Everyone who tried this product has seen that it isn’t too hard to chew on, so it can be used for dogs with teeth problems and sensitive gums. Pedigree Dentastix will also freshen your dog’s breath, but in some cases, your dog will still smell, just on beef now. This chew isn’t suitable for puppies and dogs under 22 pounds. You can safely use this product every day, to improve the state of your pup’s teeth, still, we advise you to combine it with teeth brushing. Provide your pup with plenty of fresh water once he munched on this delicious chew. 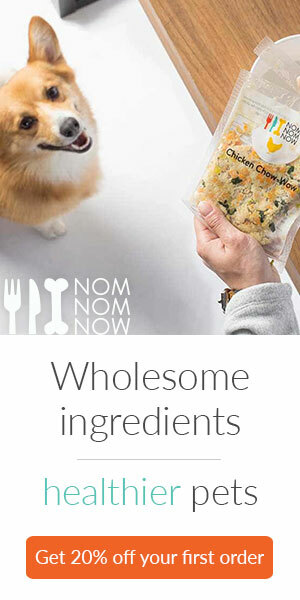 Bonebone is a U.S based brand that uses only ingredients made and sourced in the U.S.A. We chose their dental chew that is suitable for medium-sized dogs under 60 pounds. But they also have chewable toys for small and large dogs. To make this nylon chew more appealing, Bonebone infused it with bacon scent and flavor. Besides bacon, you can choose real chicken and peanut flavor as well. This dental chew is patented to have ridges, thus it will provide a good dental stimulation. Make sure that you pick the appropriate size for your pup to get all the chewing benefits. It is necessary to mention that this is a dental chew toy, meaning that it isn’t safe to ingest. If you notice any signs of wear, tooth marks, or tears you need to discard the toy and buy a new one. This means that you need to supervise your pup while he is chewing to avoid any accidents and trips to the vet. Moreover, if your pet or any member of the household has peanut allergies you shouldn’t buy peanut flavored chew toy. If you want to keep your dog’s teeth healthy and prevent periodontal disease, you need to brush his teeth regularly. Dental chews like Vet Solutions Enzadent are great at tartar and plaque prevention but need to be combined with teeth brushing. This chew is made of beef hides that have abrasive properties and will scrub of tiny food particles and bacteria. Thus it works great as tartar and plaque control, furthermore, dogs that don’t have these problems can also benefit from these edible chews. Made for medium-sized dogs with a poultry flavor, that will be hard to resist and a real treat for your dog. This product also uses naturally occurring enzymes from the saliva and combines them with abrading action of beef hides. We advise you to monitor your dog while he is munching on this dental chew since it can be to hard and injure your dog. If you can’t make an indent with your nail in this chew you need to discard it since it can break a tooth. Virbac is a well-known pet brand that makes a variety of safe and effective product for dogs. In fact, they are so good at it, that they are often recommended by vets. This chew sports an exclusive Dual-Enzyme system and abrasive texture. This means that it scrubs off tiny particulars after the meal and reduces tartar and plaque. Since it is made from beef hides that have abrasive properties your dog’s teeth will be clean and tartar deposits will be visibly smaller. To make this chew more appealing Virbac incorporated poultry flavor that will be a hit with your pup. This treat is best combined with regular tooth brushing, but it can serve as a substitute when you don’t have time. It will also remove any foul breath, and leave your dog’s mouth clean and smelling fresh. For optimal results, give your dog one chew a day, or one after every meal. This product is available for small, medium, large and extra large dogs for an optimal dental health. This product is made in Kansas from natural and easily digestible ingredients. They are a bit expensive compared to other dental chews, but many pet parents love them. These are edible treats that have poultry flavor and Greenies included a variety of vitamins and minerals to make them healthier. They are specially designed to remove bad breath and leave your pup smelling great. Furthermore, their unique texture helps them scrub teeth to the gum line, and remove plaque and tartar buildup. You can use them as preventive oral care or for a dog that already has dental problems. This product comes in sizes appropriate for petite, regular, and large dogs. Still, they aren’t safe for pups weighing less then 5 pounds or dogs younger than 6 months. For optimal results give your dog this treat once a day and incorporate teeth brushing for better results. Stick with the recommended size for your pup, and supervise him while he is chewing. How To Find The Best Dental Chews For Dogs? There is a variety of different types of dental chews on the market. In order to find the one that will work for you pooch consider his chewing habits. Is he an overly aggressive chewer, does he swallows big pieces, does he have loose teeth and gum problems? Answer these questions and you are one step closer to finding the chew for your dog’s teeth. What Are The Benefits Of Dog Chews? All dogs are born with an extreme desire to chew on everything in sight. To minimize the damage in your household, use dental chews to fulfill your dog’s natural needs. You probably noticed that your pup is much calmer once he gets a hold of his chewing toy. Chewing relaxes dogs and is especially beneficial if you have an anxious pooch. This mainly applies to dog chew toys. Most dogs get addicted to them and aren’t interested in any other means of play. Is the biggest benefit of dental dog chews since most of them are formulated to remove tartar of plaque. Furthermore, they will freshen your pup’s breath and to some extent can be a substitute for teeth brushing. What Are The Different Types Of Chews? There is a variety of different kinds of dental chews for dogs but in order to help you find what works best for your pup, we will divide them into two categories. You can’t go wrong no matter what you chose since both types are able to clean your pup’s teeth, and that is the thing you should focus on. This type of chews includes, treats, bones, sticks, or anything else that is safe to digest. Simply put, dogs love them, because they smell and taste delicious. Furthermore, they will clean your pup’s teeth without him knowing it. On the other hand, they can be smelly, sticky and your pup can leave a mess behind, especially if he’s been chewing on bones. Furthermore, bones can splinter and aren’t safe for dogs that have loose teeth. Hence you need to supervise your pooch while he is eating. One more downside can be the cost of edible chews, and the need to buy them frequently. Are cleaner chew option and are usually made of rope, nylon, or other materials that stimulate dental health. Once more great feature is that they are cheaper than natural chews, hence a choice for budget-conscious owners. On the downside, these are not so appealing, since they aren’t flavored, although some of them have an appealing scent. Furthermore, you need to monitor your dog while he is chewing since these materials aren’t digestible and can cause intestinal blockage. The approval of The Veterinary Oral Health Council means that the dog chew can really help reduce plaque and tartar buildup. For foods, treats, and chews to gain approval, they need to be able to reduce plaque or tartar by at least 10%. If a chemical plaque removal agent is used, the product must be able to reduce the presence of tartar and plaque by at least 20%. Look for a product that is made in the U.S since the rules and regulations about the quality of ingredients are stricter. Avoid products that contain ingredients from Asia, or are made there, since there is no telling for sure about the quality of the chew. How To Provide A Safe Chewing Experience? Small chews won’t have any beneficial effect on your pup’s teeth because he will swallow them whole. One more thing to consider is that, these chews contain calories, hence they can make your pup pack on the pounds. It is no coincidence that you can find specially designed dental chews for small, medium, and large dogs. Inappropriate size will do nothing for your dog’s dental health, and can only lead to weight gain or complete refusal of the chew toy. If your dog already has dental problems you should stay away from bones because they can break a tooth. Furthermore, if you have an aggressive chewer he can crush the bone an swallow tiny sharp fragments. If you decide on bones it is best to buy a fresh one, with pieces of meat and cartilage still on. But remember, you need to throw them away after a few hours since they can be contaminated by bacteria. Think about what will be fun and provide hours of nibbling entertainment to your pup and go with that chew. There is no sense in spending money on something your pup won’t find interesting. No matter what type of chew you ultimately decide on, you need to watch your dog while he is chewing it. Some dogs swallow too fact, some of them are aggressive chewers that destroy the toy and ingest pieces of it. Now that you know a little bit more about dental chews and things you need to consider, we will review 10 great products. Although all of these are good and safe, there is no telling is your pup will be interested in them, so you may need to look into more products. Dental chews are a great way to keep your pup occupied, entertained and most importantly to keep his teeth clean. There is a variety of dental treats/toys/ropes available, so finding a good fit for your pup can take some time. The best dental chews for dogs should always clean teeth, be made from safe ingredients, and appropriate for your dog’s size. If you are looking for tartar and plaque control stick with the products that are approved by VOHC. Moreover, you should always supervise your dog while he is chewing and be aware of the health risks. And although dog dental chews are formulated to keep your dog’s teeth clean, they can never substitute regular teeth brushing.